the sixth of the paramitas: perfect non-conceptual wisdom. the class of Buddhist literature that was mainly discovered by Nagarjuna in the second century. Its central topic is emptiness. 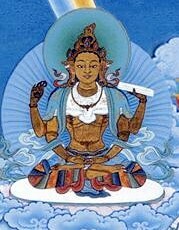 the female deity who is the embodiment of transcendent wisdom. "Prajnaparamita is the wisdom of directly realizing the non-conceptual simplicity of all phenomena, which has arrived at, or will lead one to, non-abiding nirvana." ↑ From The Words of Jikme Chökyi Wangpo by Khenpo Tsöndrü. This page was last edited on 15 January 2018, at 15:36.